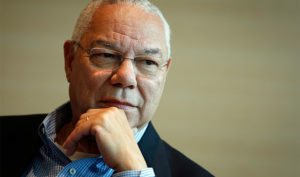 Iran’s leadership will never use a nuclear weapon if they produce one because Teheran knows Israel has 200 nukes pointed at the Islamic Republic, former U.S. Secretary of State Colin Powell said in an email leaked to the public last week. The email exchange took place in 2015, around the time of Prime Minister Benjamin Netanyahu’s speech to the U.S. Congress on Iran’s nuclear threat. Powell’s comments in the email were a reference to “a nuclear capacity never confirmed or publicly acknowledged by the Jewish state, which is not a signatory of the UN’s Nuclear Non-Proliferation Treaty,” the Jerusalem Post reported on Sept. 17. The former secretary of state’s estimate that Israel has 200 operable warheads was based on “public estimates” of Israel’s arsenal. It has been 10 years since Powell last had access to classified material, a spokesman for the former secretary told the Associated Press on Sept. 16. The State Department declined to comment in detail on the report, stating only that it supports enforcement of the Nuclear Non-Proliferation Treaty.